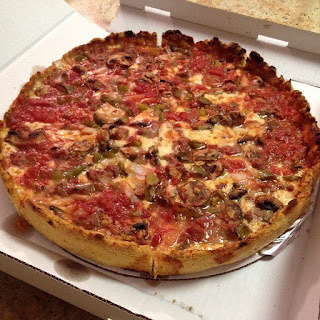 This is another one of Chicago's famous deep dish pizza stops. Also, owned by a Malnati brother, it appears that there is more friendly family competition with these similar styled pizzas. There are a few key differences that Pizano's does that makes them stand out, but not for the better. First of all, the cooking process I believe is a little different. They cook them a little faster by using a little hotter oven which actually makes the crust a little drier and also burns some of the edges. Also, they sweat their vegetables which unfortunately gave the pizza a little added oil. However, despite these changes, they still produce a good deep dish pizza that doesn't remind me of cardboard like some of the other restaurants. They have a good ratio of crust to cheese to sauce allowing me to safely give them a 3.5 mile rating. Whenever craving deep dish, this place is definitely a possibility. When ordering deep dish, I always love getting tons of toppings. The Rudy Special combines some of the best... cheese, sausage, mushroom, onion, and green peppers. I have found Pizano's to have a similar crust to Lou's except it doesn't have that buttery texture. It is more crumbly, but also appears to be a little more cooked that others... with a burnt flavor that can sometimes be more overwhelming than we like. But they do have an amazing chunky tomato sauce. A delicious tanginess fills your mouth and is amplified by some of those cooked onions. The sausage is one of the best meats to add. Rather than small sausage balls, they layer the meat underneath the cheese in a giant patty-like configuration. It has a nice spice to it, but is more savory than spicy. I was disappointed with the vegetables because they were sweated down for quite a while before being added to the pizza which added an oily feel to the toppings. The oiliness actually knocked my rating, despite having an overall great pizza. - Remember the pizza takes time to cook, though shorter than other places. So be prepared to wait. - Toppings are a must, just understand the vegetables are cooked prior to adding at Pizano's which can be disappointing. - I have also ordered appetizers here, but they weren't so great (sorry no pictures). I would just stick with the deep dish and avoid other dishes.